1.9 How To Apply For CWC Recruitment 2019? CWC Recruitment 2019: Central Warehousing Corporation (CWC) had released the latest notification for the CWC Recruitment 2019 for Management Trainee (General/ Technical), Assistant Engineer (Civil), Assistant Engineer (Electrical), Accountant, Superintendent, Junior Superintendent, Hindi Translator, Junior Technical Assistant posts. 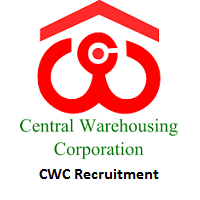 Candidates for further more information regarding through CWC Recruitment 2019 you can see the official website of Central Warehousing Corporation (CWC) that is cewacor.nic.in. Applicants can apply for CWC Recruitment 2019 Openings from 15th February 2019 to 16th March 2019. Candidates who are searching for various sites on the internet for cewacor.nic.in Jobs 2019, they can check this article. In the below section they mentioned more information through CWC Recruitment 2019 Notification such as eligibility criteria, selection process, important dates, application process, salary details, application fee, important links, others. Degree with 1st class Master of Business Administration, Specialization in Personnel Management or Human Resource or Industrial Relation. or Marketing Management or Supply Chain Management from recognized University/Institutions. 1st class Post Graduate degree in Agriculture with Entomology or MicroBiology or Bio-Chemistry or 1st class Post Graduate in Bio-Chemistry or Zoology with Entomology from recognized University/ Institution. Preference will be given to those who also possess Post Graduate Diploma in Warehousing and Cold chain Management/ Quality Management from recognized University/Institution. A Degree in Civil Engineering . A Degree in Electrical Engineering. B.Com or BA (Commerce) or Chartered Accountant or Costs and Works Accountants or SAS Accountants of the Indian Audit and Accounts Department with about three years’ experience in Maintaining and auditing of Accounts in Industrial / Commercial /Departmental Undertakings. Post Graduate Degree in any discipline from a recognized University or Institution. Degree in any discipline from a recognized University or Institution. Master’s degree of a recognized University in Hindi/English with English/Hindi as a main subject at the degree level;or Master’s degree of a recognized University in any subject with Hindi as the medium of Instructions and examination with English as a compulsory subject at the degree level; or Bachelor’s degree with Hindi and English as main subject or either of the two as medium of examination and other as a main subject plus recognised Diploma/Certificate Course in translation from Hindi to English and vice versa or two years’ experience of translation work from Hindi to English and vice versa in Central/State Government Offices including Government of India Undertakings. Degree in Agriculture or a degree with Zoology, Chemistry or Bio-Chemistry as one of the subjects. Applicants who are eligible, they can see the entire information of the selection process. You can also see the official website of Central Warehousing Corporation (CWC) that is cewacor.nic.in for more updates. Candidates who are ready to apply for these posts, those applicants can see the information through post-wise vacancies in the below section. For more information about pot – wise vacancies, you can also check the official notification for CWC Recruitment 2019. For all selected candidates satisfied the pay scale for these posts. How To Apply For CWC Recruitment 2019? First Of All, visit the official website of Central Warehousing Corporation (CWC) that is cewacor.nic.in. The home page will appear on the screen. In that, you can see the many sections are there. You can go to the latest news section. Next, you can see the many notification links are there. You can search for the CWC Recruitment 2019 notification link. Read the complete notification carefully. If you are eligible then fill the application form correctly. Recheck the application form whether correctly or not. Take print out of the CWC Recruitment 2019 application form for further reference. Applicants can bookmark our site that is Sarkari Recruitment by clicking Ctrl+D for more updates on CWC Recruitment 2019, and they can also share this information along with their friends. If any of the applicants have doubts, they can comment us in the below section. Thank you.